A ‘Prayut Effect’ in Southeast Asia? 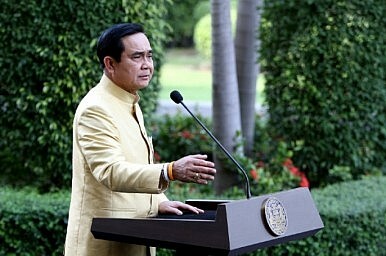 The junta chief’s way of politics offers a cautionary tale for the region’s new leaders. Three new leaders have risen to power in Southeast Asia since 2014: Thailand’s Prayut Chan-o-cha, Indonesia’s Joko “Jokowi” Widodo, and Myanmar’s Aung San Suu Kyi. In some ways, the three could not be more different. Prayut was the army chief who led a coup and established a new government in Thailand. Jokowi was an ordinary entrepreneur who became mayor of Solo, governor of Jakarta, and president of Indonesia despite having no ties with either the military or Suharto. Suu Kyi is a democracy icon who led her party to victory in the 2015 election. The three of them emerged victorious by campaigning for genuine reform in their respective countries. Suu Kyi fought long and hard in order to defeat the military-backed party in Myanmar; Jokowi mobilized a young constituency to displace the old order in Indonesia; and Prayut invoked the violent conflict between Thailand’s major political parties to justify the imposition of martial law in the country. Jokowi’s quick ascension to the presidency boosted Indonesian democracy, while Suu Kyi’s electoral victory assured Myanmar’s transition to modern democracy would continue. Meanwhile, though Prayut’s usurpation of civilian power was condemned by many, some also acknowledged that his new government successfully ended the vicious street clashes in Bangkok and other urban centers in Thailand. Jokowi and Suu Kyi captured the aspirations of their people to strengthen representative democracy, while Prayut symbolized the lingering influence of authoritarianism in the region. If asked to choose, pro-democracy forces would certainly prefer to replicate the strategies of Jokowi and Suu Kyi in order to end one-party dominance in Cambodia, Vietnam, Singapore, and Malaysia. Indeed, opposition parties in the region briefly appeared to be headed toward clinching political victory in 2014 and 2015 but the rebellion in the ballots didn’t happen as expected. Perhaps it will take more time before a strong democracy movement can emerge and gain power in these countries. In the meantime, the Prayut way of politics continues to hold sway in Thailand. Here is a self-proclaimed ‘non-politician’ politician who held on to power by ignoring the democratic process. He presents himself as a reformer who rejects the detested methods of bureaucratic politics. He offers quick (albeit extra-legal) solutions to fix what is wrong in society. Being mocked by the Western media for his politically-incorrect antics has only provoked him to make more offensive remarks in public. Jokowi’s style is also unusual, though not nearly as crude. Suu Kyi is also non-traditional but not controversial. It is no surprise that unlike Jokowi and Suu Kyi, Prayut is widely condemned outside Thailand. However, some of Prayut’s methods and manners are surprisingly gaining traction in the region. In the Philippines, a leading presidential candidate is called “Dirty Harry” because of his threat to wipe out criminals by executing them. Like Prayut, he is described as a non-politician who is ready to overhaul society even if his means are questionable or even unconstitutional. In Malaysia, the beleaguered ruling party has enforced draconian measures to silence critics and the opposition. In Cambodia, opposition leaders are harassed by no less than the prime minister. It is not like Prayut has suddenly become the model of effective leadership. Rather, his methods are becoming less aberrant as more leaders in the region, both elected and unelected, downplay their public adherence to ethics, dialogue, democratic principles, and rule of law. This is a dangerous trend because it misleads people to think that human rights can be abused and democratic traditions can be ignored to allow the leader or the state to build a better nation more effectively. While many in the region wanted their leaders to be like Jokowi and Suu Kyi, the specter of Prayut is too strong to ignore. Prayut took control when traditional politicians in Thailand failed miserably to uphold civility. The lesson here is that non-politicians like Prayut will always find the mandate to lead when there is a visible breakdown of political order and a subsequent yearning for substantial social change. Sometimes, the situation will produce a Jokowi or a Suu Kyi heroic icon. But there’s always the unfortunate chance that a Prayut figure will rise to grab power. Jokowi, Suu Kyi, and Prayut are three Southeast Asian leaders that have captured our attention since 2014. Of the three, I fear it is Prayut who will have a greater (though quieter) influence in the region. Though Prayut himself may eventually be discredited, his methods will remain relevant, especially in a region desperately seeking stability. The challenge is to aggressively promote democratic practices and support progressive movements so that we can prevent the emergence of little and big despots. When there’s real or imagined disintegration of societies, we need to prove that there’s an alternative to governments enforcing blind conformity and discipline. The alternative is what leaders like Prayut aim to subvert: democracy.